Kraft's move for Cadbury has raised concern over the future of the British chocolate maker's iconic brands. "Cadbury reminds me of when I first had chocolate... It's as old as all of us"
London, England (CNN) -- It would be a mistake for Kraft to mess with the taste of Cadbury chocolate if the American food giant's takeover of the iconic British confectionary firm goes ahead, industry experts warn. Cadbury's board accepted a $21.8-billion offer Tuesday after weeks in which had robustly rebuffed Kraft's approaches. Approval by shareholders would end the Birmingham-based firm's near two centuries of independence. That scenario has prompted accusations of a sellout, concerns over the future of the company and jobs at its Bournville headquarters and a "Keep Cadbury British" campaign backed by trade unions, lawmakers and Facebook fans of the company. 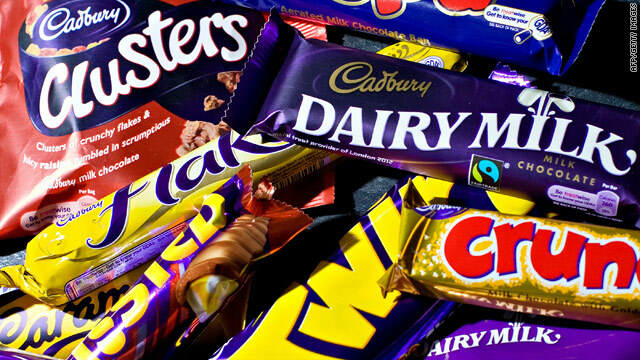 Others expressed concern over what the takeover would mean for the taste of Cadbury tuck shop favorites such as Dairy Milk, Crunchie and Creme Egg, fearing the U.S. company could attempt to impose "American-tasting" chocolate on British palates. "Kraft are cheesemakers. What the hell do they know about chocolate?... Be afraid, be very afraid," wrote Tom on Facebook. "Keep out the yanks... all there chocolate tastes sh*te anyway! Cadburys is british and should stay that way! Theres no taste like it anywhere in the world," wrote Gurny Bairns. But chocolatier Paul A. Young told CNN that Cadbury was a "heritage brand" whose basic recipe shouldn't be altered. "A lot of people who have had Cadbury's chocolate in other countries know that it doesn't taste the same. I think it would be a real mistake to change it," Young said. "When I eat Cadburys it reminds me of when I first had chocolate and we all grew up with that. It's as old as all of us and it would be a shame if we lose part of that heritage of why people love chocolate in the UK." Young said Cadbury owed its distinctive taste to the way in which milk was added and the type of milk used in its trademark Dairy Milk brand, which is advertised as containing "a glass and a half of milk in every bar." He said the method gave Cadbury products a less acidic and smoother taste than American brands of chocolate. It is usual for food companies to tailor recipes to local preferences and conditions, Young said; for instance, chocolate in hotter countries is made to a different recipe so it doesn't melt as easily. In a statement issued Tuesday, Kraft Chairman and CEO Irene Rosenfeld said her company's offer represented a "compelling opportunity" for Cadbury. "We have great respect for Cadbury's brands, heritage and people. We believe they will thrive as part of Kraft Foods," said Rosenfeld. A takeover by Kraft would likely bring Cadbury's manufacturing methods under scrutiny as the new owners seek to see where they can cut costs and maximize profits. Young, who has developed chocolate brands for British supermarkets, said it was possible to tweak production methods and recipes without compromising quality, but warned it was risky to mess too much with established and much-loved brands such as Dairy Milk. "You have to be very skilled. We all know of brands which have gone the other way and compromised too much," he said. "There are people who have worked there for years and years to develop the characteristics of Cadbury products and they will be very worried. There could be a mini-war." Young said there were ways in which Kraft's takeover could benefit Cadbury without jeopardizing its existing customer base. Kraft's international reach could help the company expand overseas, while Cadbury could also move into the burgeoning luxury chocolate market. "People are wanting more unusual and more creative varieties of chocolate. They want a slightly healthier chocolate and they don't want the fat and sugar content," he said. "Cadbury could benefit from that if they had a luxury brand under their umbrella. If Kraft can offer something like that which reflects the way the chocolate industry is going then brilliant." But he said regardless of whether Kraft made a success of Cadbury or not, many people in the UK would be disappointed to see a company founded by Quaker brothers in the mid-19th century sold to American owners. "Some brands have a following; they are a part of our lives like football clubs," he said. "People know the story and they connect with it quite personally. I think people will be annoyed to see an American company taking over."